Minnesota's minimum wage hikes have led to slower job growth in the restaurant industry and significant job losses among younger workers, a new study has found. Wisconsin last raised its minimum wage in 2010 to keep pace with the federal minimum wage of $7.25 an hour. Minnesota's began a series of minimum wage increases in 2014. It has increased from $6 per hour to $9.65 as of this January. All else being equal, "businesses will demand less labor, which could mean fewer workers and/or shorter hours per worker," Williams said. "There were workers willing to work for wages that were less than the new, higher minimum wage and businesses that were willing to hire them for that … The distortion is that the minimum wage rules out mutually beneficial agreements between workers and firms." More than 60 percent of those working in the restaurant industry in Minnesota work for the minimum wage or less. Those under the age of 24 account for 54 percent of minimum wage earners statewide. Employment in fast-food restaurants in Minnesota and Wisconsin were growing at the same rate in 2014. The rate of growth in employment in the fast-food sectors in Minnesota and Wisconsin began diverging around the same time Minnesota began raising the minimum wage, Williams said. "In total, from July 2014 to May 2018, employment at fast-food restaurants grew by 4.8 percent in Minnesota, but by 8.8 percent in Wisconsin," he said. "While other factors may have played a role, the timing of the trend break suggests that the minimum-wage increases in Minnesota accounted for much of this four percentage-point gap." An employment study by the Citizens’ League showed that many large employers, such as Allina Health, Ecolab, HealthPartners, and Securian, already pay the majority of their workers at least $15 per hour, John Phelan, chief economist for the Center of the American Experiment, said. Two other large employers, U.S. Bank and Wells Fargo, recently announced that they will soon be raising their minimum wage to $15 for all employees, he added. "The people who will be hit by this measure are not these big businesses, but the independent bookseller whose margins are being squeezed by Amazon, the immigrant store owner competing with Target and Walmart, or the nonprofit trying to give a disabled worker a break," Phelan told Watchdog. There are many differences between the two states' economies, but the sectors of their labor markets for which the minimum wage is most relevant – mainly young and lower-skilled workers – were very similar prior to Minnesota’s minimum wage hikes, Williams said. "The differences that have arisen since then thus are likely to be largely driven by the minimum wage hikes," he said. Youth employment in both Minnesota and Wisconsin – workers under the age of 24 – was fairly consistent before the minimum-wage increases began. Youth employment increased slightly in Minnesota and declined slightly in Wisconsin in the 2012-2014 period, Williams added. Youth employment in Minnesota has dropped an average 9 percent, or by 35,000 young workers, in Minnesota in the subsequent three years. It has increased by 10.6 percent, or 43,000 jobs, in Wisconsin over the same period, Williams highlighted. There are ripple effects associated with Minnesota's minimum-wage hikes, as well. That includes price increases in affected sectors and industries, which pass on the higher labor costs to customers. The average price of restaurant food in the Minneapolis-St. Paul metro area had declined by 2 percent in the four years preceding the first minimum-wage hike. It has increased by 6 percent in the four years since, according to Williams. Higher labor costs are also leading business owners and executives to invest in automation in order to reduce the number of workers needed. "Many fast-food restaurants, and retail stores, now have ordering kiosks, eliminating the need for clerks and cashiers," Williams said. The minimum-wage increases did lead to higher incomes for Minnesota workers who found new or kept their existing jobs, Williams noted. "Earnings for affected workers grew more rapidly in Minnesota than in Wisconsin following the minimum-wage hikes, with average annual pay at limited-service restaurants increasing by 5.5 percent more in Minnesota from 2014-2017," he said. This came with the cost of fewer employment opportunities for young and low-skilled workers, however, Williams added. 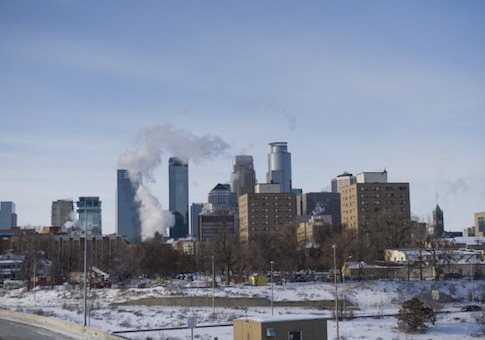 The city of Minneapolis began its own series of minimum wage hikes this year on its way to $15 an hour for all employers by 2024. St. Paul also is considering a $15 minimum wage. But the balance of empirical research supports Williams’ argument, Phelan said. "In 2008, economists David Neumark and William L. Wascher surveyed two decades of research. They found that ‘minimum wages reduce employment opportunities for less-skilled workers … [that] a higher minimum wage tends to reduce rather than to increase the earnings of the lowest-skilled individuals … [that] minimum wages do not, on net, reduce poverty … [and that] minimum wages appear to have adverse longer-run effects on wages and earnings,'" he said. "[T]he evidence still shows that minimum wages pose a trade-off of higher wages for some against job losses for others." Phelan concluded.